I’m a big fan of giving food gifts. Who doesn’t love a box of cookies, a bottle of homemade vanilla extract or a plate of boozy blondies? And, as a bonus, I get to enjoy tailoring each gift to each recipient. This past holiday season I decided to change things up a bit, though, and strayed from my typical edible presents. Instead, I decided to give gifts that would last long after the holiday season was over. Behold, my gift of choice: The wooden spoon! While I can’t take credit for the idea (there are similar items all over Pinterest and Etsy), I can say I had a fun time playing with my new wood burning tool as I worked to develop a new crafting skill. 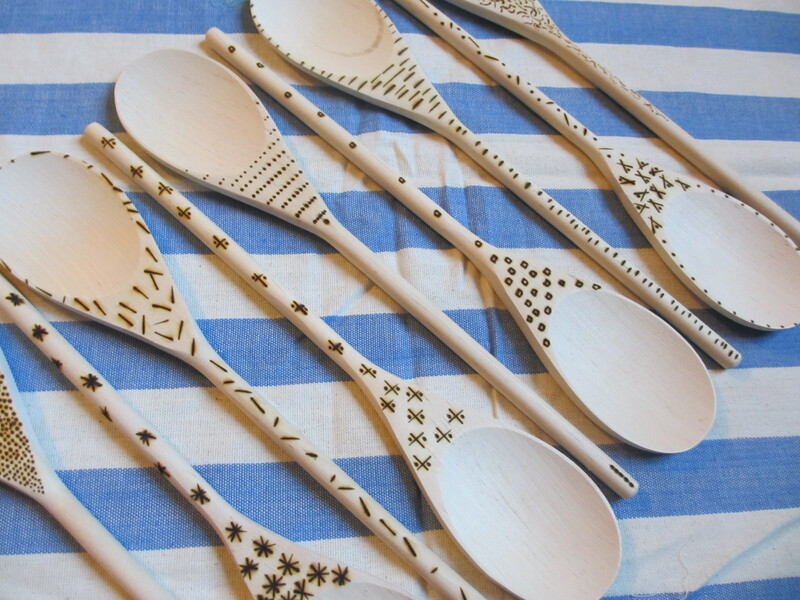 I etched a different design into each wooden spoon I had—all 36 of them—mostly so I could try out all of the attachments that came with my burner. I found the activity to be very calming, similar to casually sketching in a notepad. I was able to create a wide variety of styles so I let each recipient choose the spoon that best suited her and her kitchen. For a first go-around, I’m pretty pleased with the results. I’m hoping to move beyond spoons and engrave cutting boards, frames and more. Stay tuned to see what I do next. Burning into a flat surface is easiest, beware of curves until you get the hang of working with the tool. Pay attention! The tip of the tool gets extremely hot. This is not a tool that should be used around young kids or pets that might bump into it. Open a window or make sure you’re working in an area that is well ventilated. It smelled like a campfire in my house for a few days after I’d finished my projects. I didn’t mind, but it’s worth noting. Use a piece of scrap wood to do a test run with each tip that comes with the wood burning kit. Once the hot tip touches the wood, it has made its mark and there’s no turning back. It takes the tips a long time to cool down once they’ve been heated. The included instructions recommend you unplug the tool and let it cool completely before swapping in a new tip. To avoid a long wait time I used pliers to loosen and remove the old tip and put the new one on. Be be extra careful not to touch anything with your bare skin. Have fun! There’s no right or wrong way to design something. This entry was posted in For Our Friends and tagged @SWWUblog, crafts, DIY, for our friends, gifts, homemade, inexpensive gift, kitchen utensils, wood, wood burning, wood burning tool, wooden spoons by Something We Whipped Up. Bookmark the permalink.